Borough Market, aka London’s Foodie Central, kicks off the festive season with a celebration of international cheeses, late night shopping and expanded hours. 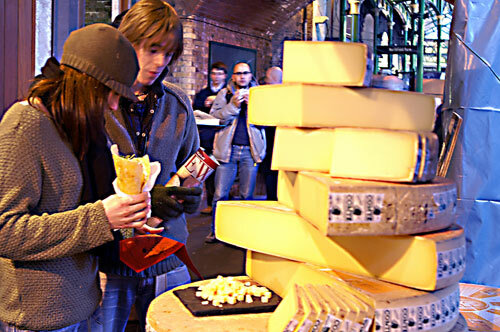 Cheese hogs the festive season spotlight at London’s Borough Market with An Evening of Cheese, from 6 to 9 p.m., 12 December. 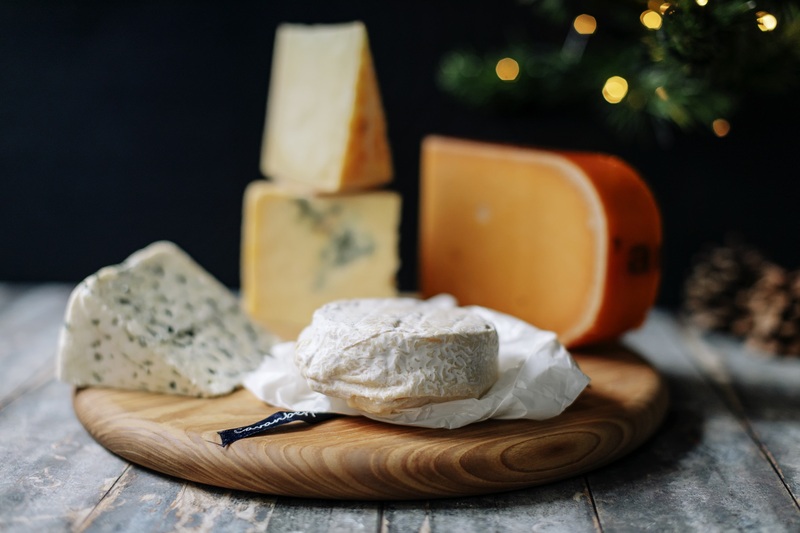 London’s biggest and oldest food market celebrates international cheeses with tastings and cookery demos with holiday recipes in the demonstration kitchen (Northern Ireland celebrity chef Paula McIntyre demonstrates at 6:30 and 7:30p.m.). 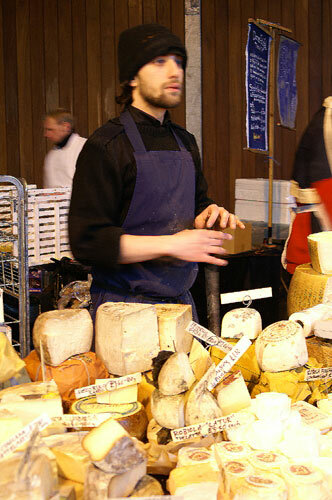 Quiz at least 20 of the market’s expert traders for cheese board and wine pairing advice. And shop for holiday goods, festive cakes, sweets and puds from guest traders. just visiting in the run up to Christmas. 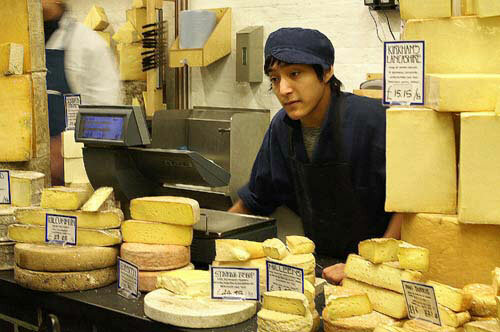 Cheese experts will offer suggestions about curating (curating?) the perfect cheeseboard while a choir fills the air with holiday music. And you can watch market cheese traders compete, one on one in a “cracking of the Parmesan wheel” competition (whatever that is) with Italian stallholder Bianca & Mora. Ireland: Cavenbert – A soft hand made cheese from award winning artisan cheesemaker, Silke Cropp at Corleggy Farmhouse situated on a ‘little windy hill’ in Cork. It’s in the center of the photo, top of page. Looks a bit like Camembert. Do you suppose that might be a hint of its taste? Spain: Canarejal Cremoso – A “torta” from Brindisa Ltd . They say that the silky centre with has fresh mushroom aromas and sweet creaminess. Can’t wait to try this one. Brindisa, by the way, was one of the founding businesses at Borough Market when it was revived as a consumer-focused market in the 1990s. Croatia: Paski Sir: An unpasturised sheep milk cheese from the island of Pag. I wonder if we’ll ever get to taste these kinds of cheeses – from European places we’ve never even heard of – after Brexit. 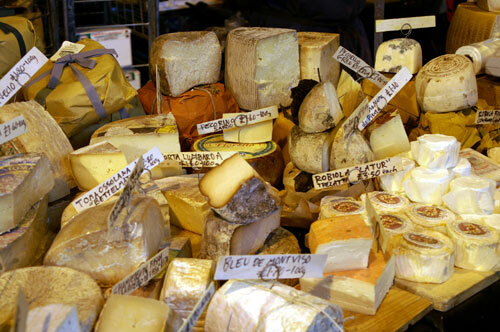 Turns out, on further investigation that Pag is known for this cheese – and partying. England: Kirkham’s Lancashire: The family who have been making this cheese for 30 years say it has a citrusy aroma and a hard yet creamy texture. Though the modern retail version of Borough Market only came to London with the foodie revolution in the 1990s, and the market buildings date from earlier, wholesale trading from the mid 1850s, there’s been a recognized market here since at least 1014. Nobody really knows when the market actually began; the earliest written reference to at this location is contained in a Norse saga about St Olav. There reference is made to “a great market town called Southwark”. 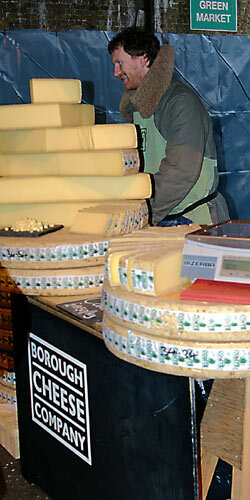 Borough Market is hard by Southwark Cathedral, between Southwark Bridge and London Bridge. But, in fact, the market may be even earlier. When the Romans first reached narrow part of the Thames, convenient for a crossing, they found it was a gathering place of traders – in other words, a market. So the market may actually be closer to 2,000 years old. The market is normally opened Monday through Saturday 10 a.m. to 6 p.m. (8 p.m. on Fridays), with a limited number of businesses trading on Mondays and Tuesday. But from December 5, the market will be fully open every day, including Sundays, until 4p.m. on Christmas Eve. Cookery demonstrations and other events are scheduled throughout the month of December, so check the market’s “Events” webpage. The market is located at 8 Southwark Street, London SE1. 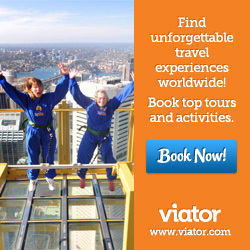 The nearest London Underground Station is London Bridge which is about five minute’s walk from the market buildings.